In Addition to our fine cabinetry, we offer granite, marble, quartz and solid surfacing options for your countertops. Adelphi is a custom cabinetry shop whose commitment to quality hasn't wavered since its 1979 opening, evidenced in its all-wood box. Choose from a beautiful array of stains, paints and glazes on pine, white oak, maple, cherry and hickory cabinetry. Engineered stone for kitchen and bath. Design your new living space with someone who really gets it. Waypoint Living Spaces are built to gracefully endure life's torture tests. 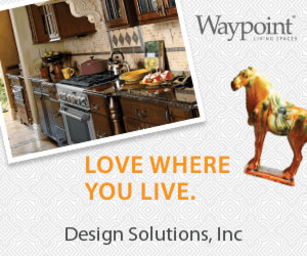 Waypoint Living Spaces® brand cabinets are proudly manufactured in the United States. Headquartered in Winchester, Virginia, American Woodmark® has supplied high quality American-made cabinets to families for over 30 years.